Conventional charcoal braai or gas grill? 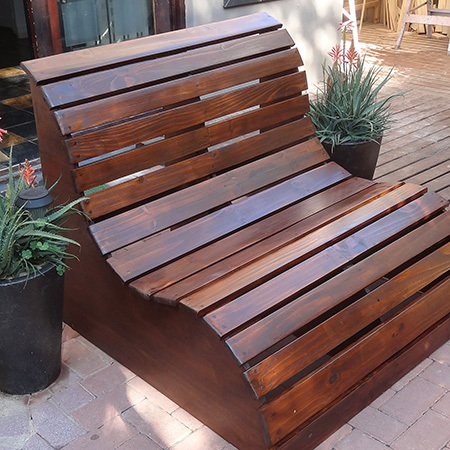 This slatted garden bench makes the perfect love seat for a garden and it’s very easy to make! 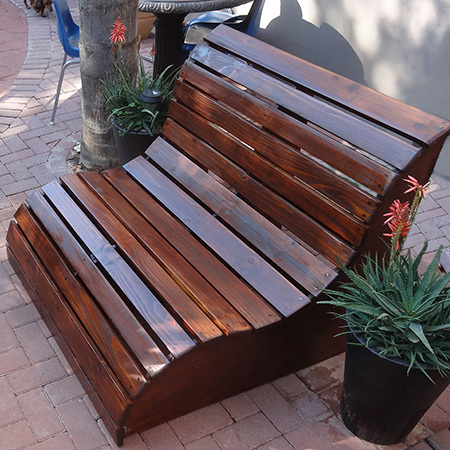 *Marine plywood is a better option than laminated pine, which may split along the seams over time if left outdoors. 1. 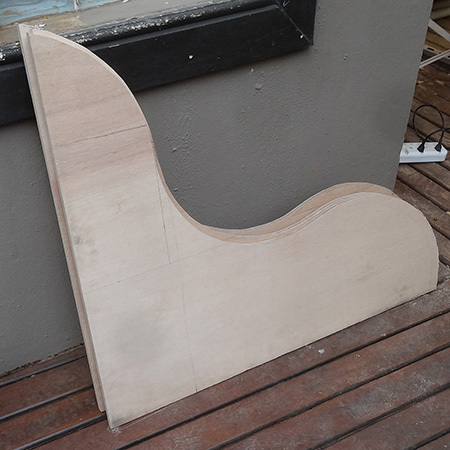 The sides and centre supports were cut from the 900 x 900mm piece of marine plywood. The curves were drawn using the lid from a braai. 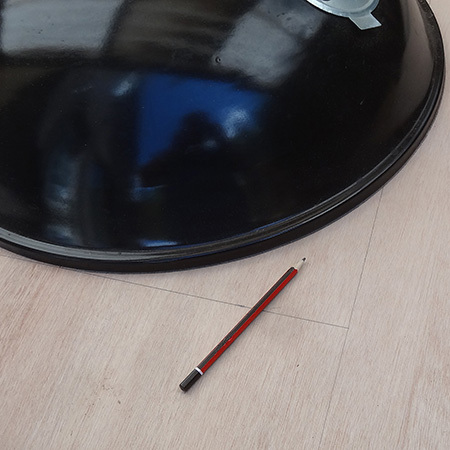 Any large circular item can serve as a template. 2. After cutting out the sides the remaining piece was used to cut the centre section. 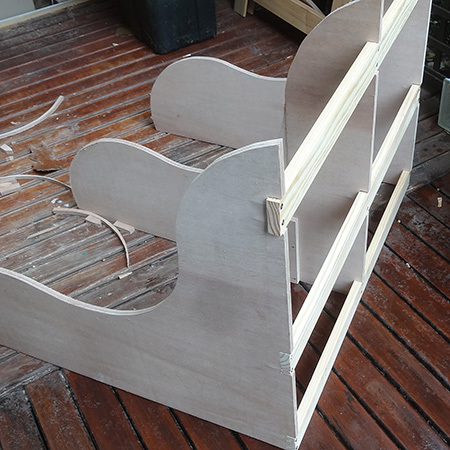 There wasn’t enough to cut a complete section, so pieces were cut to make a whole section and these were joined together using a biscuit joiner and Ponal wood glue. NOTE: If you prefer not to do this you need to order a second sheet of 900 x 900mm marine plywood. 3. Along the back of each support 3 slots were cut for mounting the 20 x 69mm back supports. One slot 100mm from the top – one in the centre – and one at the bottom. 4. 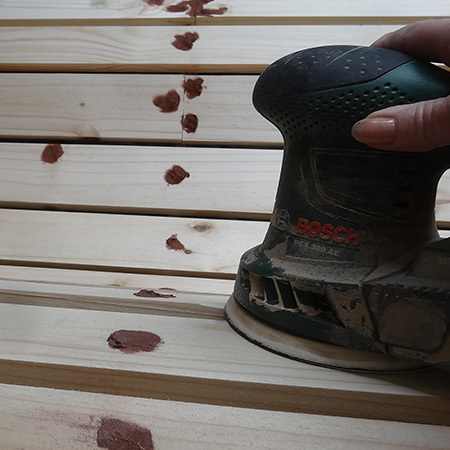 Drill 4mm pilot holes through the pine into the plywood supports and secure with 50mm screws – two screws at each join. 5. 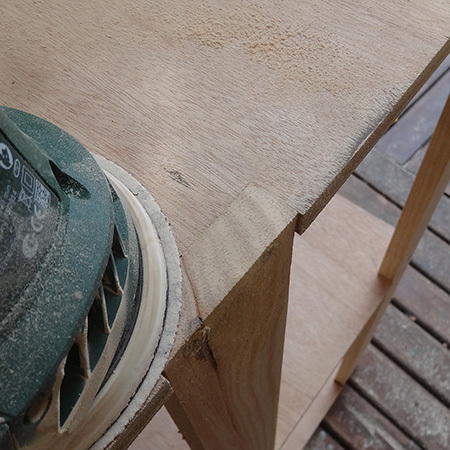 Secure the first 20 x 94mm plank at the top of the bench, making to allow a 20mm overhang on both sides. Drill pilot holes before securing with two screws at each join. Repeat this at the front (bottom edge) of the bench to ensure the supports are equally spaced from top back to front. 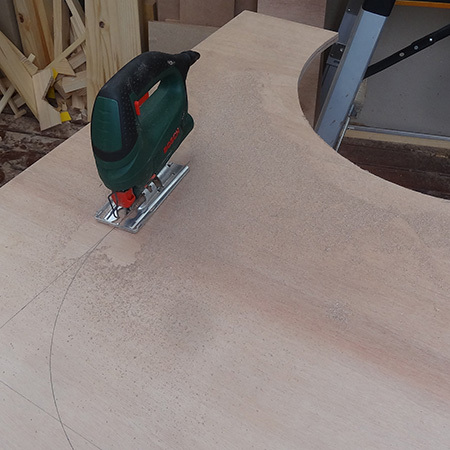 You should need to countersink the pilot holes but may find that some PAR pine is quite hard and will need a countersink to ensure the screw head is below the surface. 6. There are two 94mm planks at the top back and front bottom, as well as three 94mm planks on the seat, the remainder of the planks are 69mm. Dry fit the seat planks as best as possible and then use spacers to make sure the gaps are equally spaced before securing to the supports. 7. For this project insufficient 69mm wide planks were ordered and offcuts were used to create a full plank span. 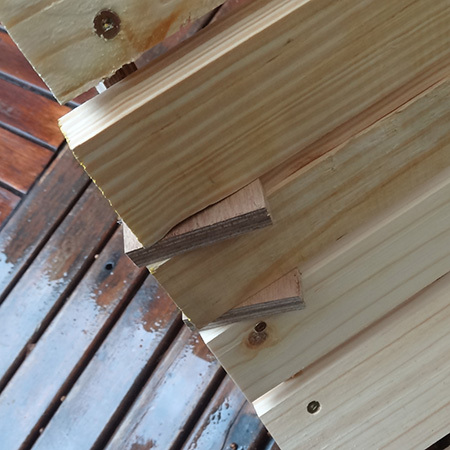 To allow for this blocks of marine plywood were secured to the centre support to allow for the screws for mounting the split planks. 8. All the holes can be filled with wood filler. 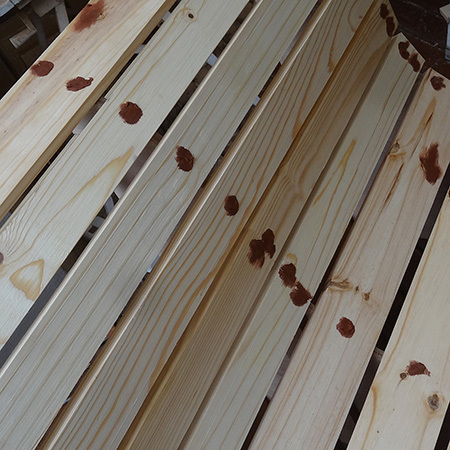 Match the colour of the wood filler to the final colour that you will stain the bench. We used imbuia wood filler on all the holes. Let the wood filler dry. 9. 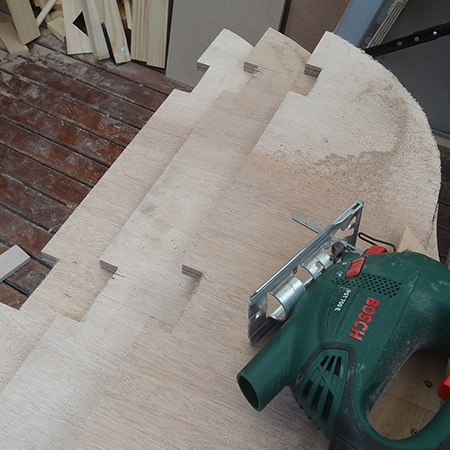 In the meantime you can use a jigsaw to trim any edges if necessary. However, this shouldn’t be required if the supports are aligned and the planks are cut to the same length. 10. 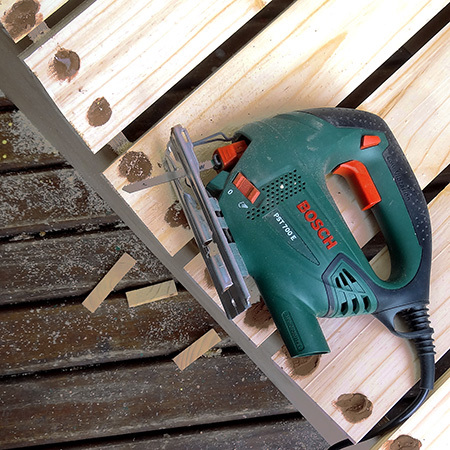 Use 60-grit sanding pads to sand away the sharp edges between the slats. You want the finished seat to be as smooth as possible. 11. 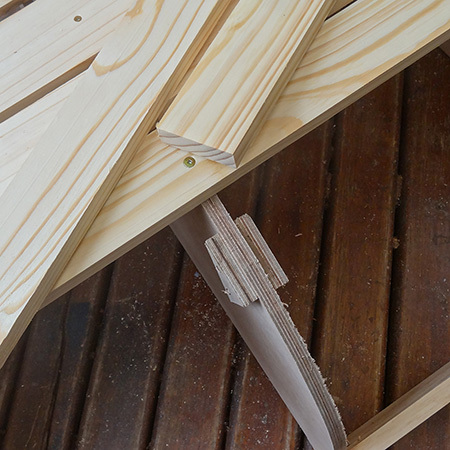 Also sand away any rough edges on the sides, and round off the edges of the slats. Repeat the sanding process with 120- and then 240-grit sandpaper for a smooth finish. Use a cloth lightly dampened with mineral turpentine to wipe away all traces of dust. 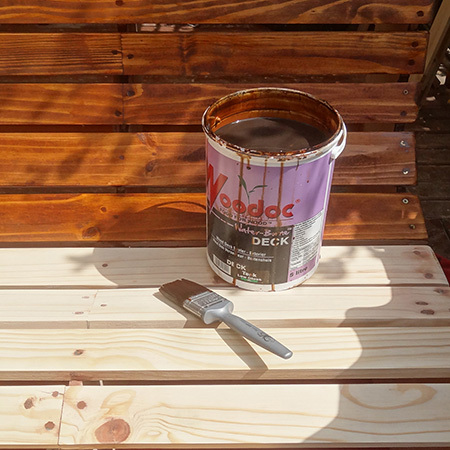 Apply Woodoc water-borne deck sealer according to the recommended instructions. 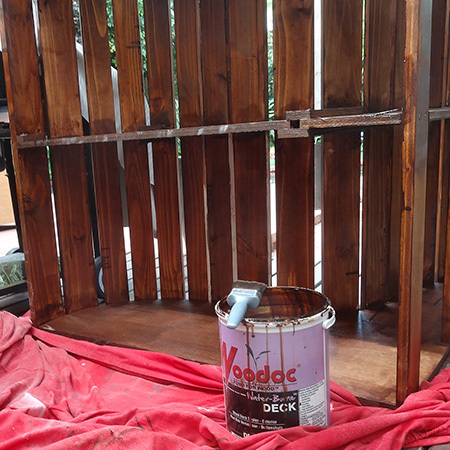 Three coats are applied with a light sanding between the first and second coats. Apply sealer to all sections, including the underside. 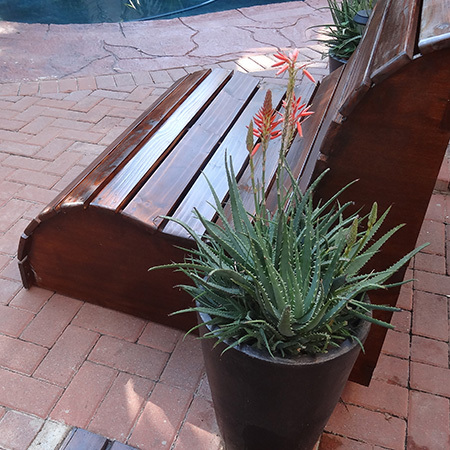 You want maximum protection for the bench if it is going to be continuously exposed to the elements. 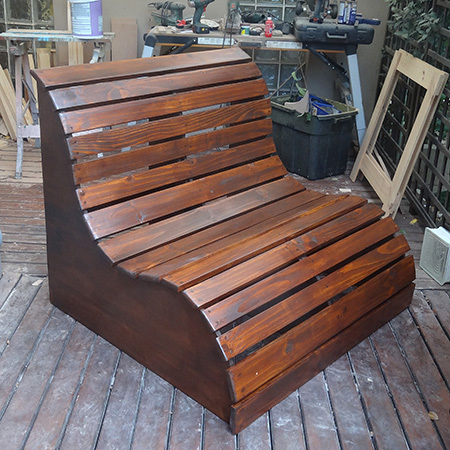 You should also re-apply the sealer as soon as the finish starts to fade, or annually. 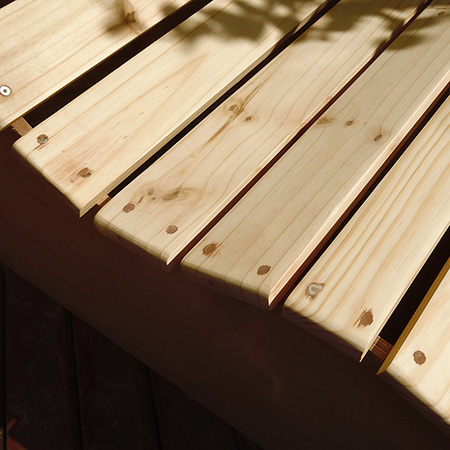 Pine is a softwood that requires sealing regularly to ensure it stays looking good.